Subaru’s new EX13 greens mower engine is specially designed version of the popular EX13 engine, featuring overhead cam (OHC) technology synonymous with Subaru’s EX series. The EX13 features a specially designed longneck fuel tank, offering ease during refueling, while also preventing costly, potentially damaging fuel spills. The engine is also backed by Subaru’s new five-year limited warranty. 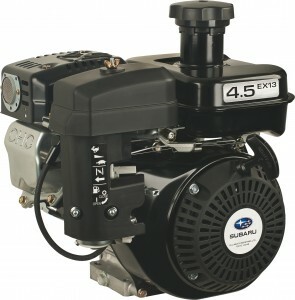 Subaru industrial engines and power products are manufactured by Fuji Heavy Industries Ltd., Japan. They are marketed and supported in North America by Robin America, Inc., a subsidiary of Fuji Heavy Industries.